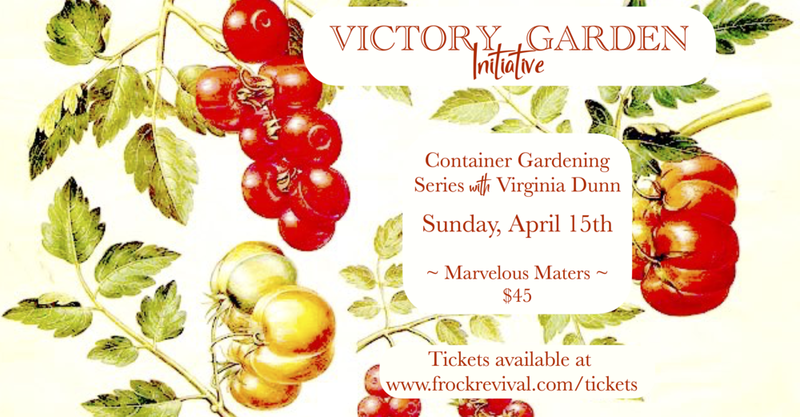 Join us Sunday, April 15th at 1pm for our Victory Garden Initiative, Container Gardening Series with Virginia Dunn. Local green thumb, Virginia Dunn continues her fantastic Container Gardening Series with a study and planting of this season's marvelous maters. This class will focus on creating a bountiful make and take planter of tomato plants poised to produce a bountiful display of marvelous maters. In addition each guest will make and take a jar of sprouts for an extra boost of nutrients to your diet. All supplies included. Large planter container suitable for tomato growth, soil, mature tomato plants, sprout seeds and the Mason jar set up for sprouts. Brunch Bites & Bevies included. Children the age of 10 and above with a ticket are welcome.